I mentioned in my previous post a bottle of water, and whilst I appreciated that particular gesture, one of the disturbing aspects of travel in the third world is the amount of waste one generates in the purchase of bottled water. Whilst this issue is somewhat alleviated when one is in a position to boil water, the injudicious use of plastics in Peru, and the lack of consciousness around their impacts is obvious. This issue obviously pertinent to my current journey as the chemicals in plastics often mimic estrogens and have strong links to the development of breast and ovarian cancers. So, in the course of visiting Peru to attempt to cure cancer, one maximises one's exposure to the very chemicals which may be causing the problem in the first instance. All the more reason to develop broader social strategies and stories about health of entire biospheres, as opposed to focus upon the individual. Below is an excerpt from the weblog of the David Suzuki Foundation about this very issue. 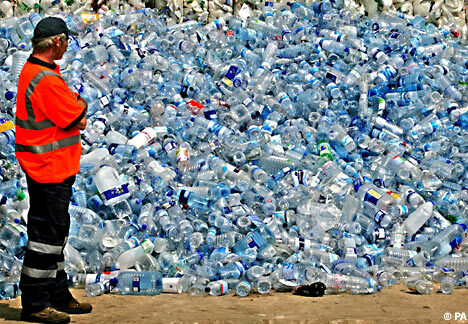 Many people prefer to spend money on bottled water, believing that it is somehow safer. Now we’re learning that the stuff in plastic water bottles may be more harmful than anything in our tap water. Bisphenol A is just one chemical that’s been in the news – and in many plastic bottles – recently. This compound mimics estrogens (human female hormones) and has been linked to breast and ovarian cancers and childhood developmental problems. It is found in clear, hard polycarbonate plastic commonly used in household and commercial water coolers and some reusable bottles, and it’s just one potentially harmful substance associated with plastic containers. There’s also a danger that governments may use the growing reliance on bottled water as an excuse to avoid their responsibility to ensure we have access to safe drinking water. The federal government must address any existing concerns about drinking-water quality with enforceable standards designed to protect human health. If you’re worried about chlorine in your drinking water, put it in a pitcher and let it stand overnight to allow the chlorine to evaporate – or consider buying a carbon activated filter for your tap. To carry water with you, fill up your stainless steel or glass bottle from the tap, and enjoy. Water is a precious resource that belongs to all of us. Let’s not take it for granted. And let’s not put it in plastic.